The unusual characteristics of the vegetation of the Ebro Delta have no parallel elsewhere in Catalonia, not only in terms of the sparseness of the plant communities, but also in terms of the quantitative potential. In the most recent catalogue there are 515 species. Areas of salty ground are mainly located at spots where the delta meets the sea and where salinisation is produced by the direct action of the sea or by the salinity of the water table. The plants growing here have high concentrations of soda in their tissues to enable them to maintain high osmotic pressure and so withstand drying. 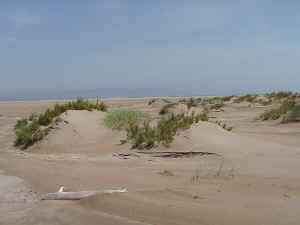 These salty zones often include sand dunes (known locally as "tores" or "muntells") which are held together to a greater or lesser degree by vegetation. In the first stage marram grass (Ammophila arenaria) and spurge (Euphorbia paralias) establish themselves. Then other species appear: first a ring of Sporolobuspungens and then above that sea daffodils (Pancratium maritimum) and, in higher and more mature locations, rest marrow ( Ononis natrix), Thymelaea hirsuta and Erianthus ravenae. In the northern part of the delta the rare Limoniastrum monopetalum appears at the last stage. Reed-beds are to be found over much of the delta in places where the water table is very high and the land is usually waterlogged. Here the most characteristic plants include reeds (Phragmites communis and Phragmites communis isiacus) and large bindweed ( Con volvulus sepium). In places where the water is deeper and remains for longer periods, sedge (Cladium mariscus and Carex sp) and reedmace (Thypha sp) are to be found. The last two species were formerly used to make chair seats, mats, baskets, etc. The riverside woods are the only forest community on the delta. They are to be found along the banks of the Ebro where the land is higher and water is always available. White poplar groves occupy the higher spots and willows (Salix alba) the low-lying areas. Other common trees include the alder, ash, elm and water-willow, as well as subspontaneous species such as black poplars, eucalyptus, locust trees, plane trees and others like Lonicera biflora ("lligabosc de riu") which are of particular interest. Where the influence of the sea is strongest the wood becomes thinner and only oleanders and tamarisks remain. There is also spontaneous vegetation in the rice paddies. In the small, fresh-water ponds known as "ullals", water lilies (Nymphaea alba) grow alongside pondweed (Potamogeton sp) which causes serious problems to agriculture since it invades the irrigation canals and even the rice paddies themselves. In the rice fields, which during the greater part of the year act as small ponds, we find, in addition to the plants already mentioned, reedmace (Lemna sp, "llaponet de pato") and bladderwort. Other species which have been considered the most representative adventitious plants in the rice-field flora are: Ammania coccinea ("presseguera"), Bergia aquatica and Lindernia dubia ("aufabigueta"). The freshwater pools or ‘Ullals’ along the delta’s junction with the higher land mass are caused by upsurgence of groundwater checked by the delta groundwater. This water permeates the karstic limestone on the inland plateau and flows underground through the limestone to the western edge of the delta where it rises to form numerous small springs and pools, up to 50m in diameter and 8m deep. The water is clear and relatively constant in temperature as a result of the continual upwelling. It has a relatively high salt content (2,000RsIcm) but the pH remains neutral due to a high base ion content. The Ullals have been greatly modified by human activity and much of this water is channelled via ditches to irrigate the market garden and fruit crops that occur in close proximity to this ample supply of fresh water. Schematic Plan of Habitats on the Delta. The wide range of habitats and the mild, humid climate provide conditions favourable to many invertebrates. Leeches were once so abundant that the legs of those working in the rice fields needed to be well protected and hundreds of thousands of the animals were exported to far-distant places every year. Some species, such as the hemipteron Naucoris maculatus (know in the delta as "cutimanya"), have almost disappeared while the crayfish Pro camba rus sp is on the increase. Mosquitoes are the most widespread and characteristic insects of the delta. As a result a systematic fight against malaria, once an endemic disease in the area, had to be undertaken, starting with the campaign launched by the Mancomunitat (Catalan regional administration) in 1917. Lepidoptera include a vast number of species which attack crops. Some are interesting, however, from the biogeographical point of view like Chilo supressalis, Borbo zelleri or the various species of the Danaus sp that are very occasionally observed. Many interesting small species of crustaceans, such as Apus cancriformis, live in the rice paddies. With such an extensive range of entomological fauna, predators are well represented: arachnids like Argiope lobata which inhabit sandy areas, or many Odonata such as dragonflies (Libellula sp and Calopterix sp). On summer nights any source of light draws veritable clouds of mayfly (Polymitarcis virgo). There are also many varieties of beetle which play a basic role in the different ecosystems: Hydrophilus ("iaio") in the rice paddies and their aggressive larvae known as "miquels", Pimeha in sandy zones, Scarabeus, Anoxia, Amphimalon, Elenophorus, etc. Among the reptiles and amphibians first mention must go to the very numerous slow worms and Montpellier snakes. Turtles on the other hand are rare and stripeless tree frogs (Hyla meridionahis) have almost died out. Only the marsh frog (Ranaperezi) is still present, but in rapidly declining numbers. Toads include the common toad and the western spade-foot toad. The painted frog (Discoglossus pictus) is found here and there throughout the delta. Sly rogue lizards (Podarcis hispanica) are common everywhere while the spiny-footed lizard (Acanthodactylus erythrurus) and species such as the large psammodromus lizard (Psammodromus algirus) scamper about the beaches. There are few newts but Moorish and Turkish geckos (Tarentola mauritanica and Hemidactylus turcicus) are found in buildings. Fish are abundant on account of the important part played by water in the delta and the various levels of salinity which range from the insignificant quantities of salt in the small, fairly deep fresh water ponds ("ullals") to sea water, via the areas where the river flows into the sea. Sturgeon and river lamprey have declined sharply, as have allis and twaite shad (Alosa sp). On the other hand, new species such as the large-mouth bass (Micropterus sabmoides), pike (Esox lucius), black bullhead (Ictalurus melas) and wels (Siburus glanis) have appeared. Aside from these rather rare species there are other more common fish including ,mullet, cyprinids and serranids, hundreds of tons of which are caught each year. Eel fishing is a tradition: 30-50 tonnes of eels and over 5 tonnes of elvers are netted every year. The coast of the delta has won well-deserved fame for its sea species, which include gilthead, ombrine, meagre and red mullet. Owing to the size of the human population of the delta, large mammals, such as the wild boar and badger, are only to be found occasionally, but it is known that in days gone by there were red deer and roe deer. A few rabbits still remain and red foxes are bred. There are still a few common otters, hedgehogs and weasels, while brown rats, water voles, wood mice and common European white-toothed shrews (Crocidura sp) are very widespread. The formerly very large pipistrelle bat population has greatly declined. Birds make up the most striking aspect of the fauna of the delta and, far from constituting a merely local source of interest, are of the utmost importance internationally, both in quantity and quality. It is because of its role as a breeding ground for water fowl, waders and seabirds, and as a stopping place for winter migrants that the delta has been defined as an area of great significance in various conventions and has always been classified in the ‘A’ category, as being in urgent need of protection. The size of the bird population is particularly obvious in the autumn months of October and November when the rice has been harvested and the still waterlogged fields are invaded by many thousands of water birds which are either migrating through or settling in for the winter. In November 1980 and 1981 over 75,000 ducks were counted in addition to 16,000 coots. The autumn average is 53,000 ducks and 13,000 coots while in winter there are 26,000 ducks and 5,000 coots. These figures represent over 90% of the waterfowl that winter in Catalonia and about 10% of those that winter in the whole Iberian peninsula. Interesting species are the shoveler duck (Anas clypeata) and the widgeon (Anas penelope) though the greater part of the flocks is made up of mallards (Anasplatyrhynchos). Other interesting species are shelducks (Tadorna tadorna), gadwalls (Anas strepera), teals (Anas crecca), and pochards (Aythyaferina). Representatives of other groups of birds include: the marsh harrier (Circus aeruginosus), short eared owl (Asioflammeus), bittern (Botaurus stellaris), little bittern (Ixobrychus minutus), night heron (Nycticorax nycticorax), squacco heron (Ardeola ralloides), cattle egret (Bubulcus ibis), little egret (Egretta garzetta), grey heron-(Ardea cinerea), greater flamingo (Phoenicopterus ruber), great crested grebe (Podiceps cri status) , purple heron (A rdeapurpurea), water rail (Rallus aquaticus) , Baillon’s crake (Porzanapusilla) , coot (Fulica atra), oystercatcher (Haematopus ostralegus), black-winged stilt (Himantopus himantopus), avocet (Recurvirostra avosetta), collared pratincole (Glareolapratinicola), slender-billed gull (Larus genei) , Audouin’s gull (Larus audouinii), and many others. The bird population consists of 50,000-100,000 individuals belonging to about three hundred species, 60% of the total number of species found in Europe. The local nomenclature comprises some 250 names which makes it one of the richest in the world.